Calicut University has invited applications for the admission to the prestigious Master of Application (MCA) course 2014 -15. The admission to MCA course will be made on the basis of merit of the Entrance Examination conducted by the University. 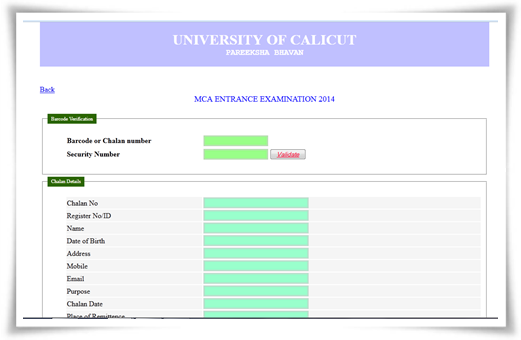 Application can be submitted till 28th June 2014, 5 PM through the official website of Calicut University. Candidates having any bachelor's degree under 10+2+3 pattern of education with Computer science/Computer application/ Mathematics/ Statistics/Engineering and Technology as one of the main or subsidiary subject with at least 50 % or equivalent CGPA aggregate can apply for the MCA course. After the submission of online application, signed print out of application with Passport size Photograph attested by the Gazetted Officer along with the original chalan receipt of the remitted fee along with other important documents should be forwarded to the chief Co Coordinator University of Calicut on or before 5 P.M on 30th June 2014. Those who are awaiting the results of the qualifying examination can also apply while within 6 days of the publication the University results. An entrance examination of 2 hours duration with 100 objective type questions of 1 mark each will be conducted on 3rd August 2014. Questions from various disciplines like Computer Science, Mathematics, Statistics, Physics, Chemistry and Reasoning will be asked for the exam. The rank list will declared on 12th August 2014. After the counseling of selected students, the 1st semester classes with commence on 1st September 2014. With Kozhikode and Thrissur as the exam centres, time and venue of the examination will be announced later through a notification. Hall tickets can be downloaded from the University website by using their online registration number. Applicants should perpetually bring the hall ticket while appearing for the examination. As per the norms, rank list prepared on the basis of total marks secured by the candidates in the entrance examination will be published in the University website along with schedule for counselling. As no intimation will be sent to individuals regarding the admission or entrance exam, candidates are advised to visit the University website regularly or also to go through the press release given by the University in the leading dailies. To know more about the admission procedure and to apply online for MCA courses 2014, do visit the official website of the University.